Living Cell - is futuristic building modules that will look great on any game table. 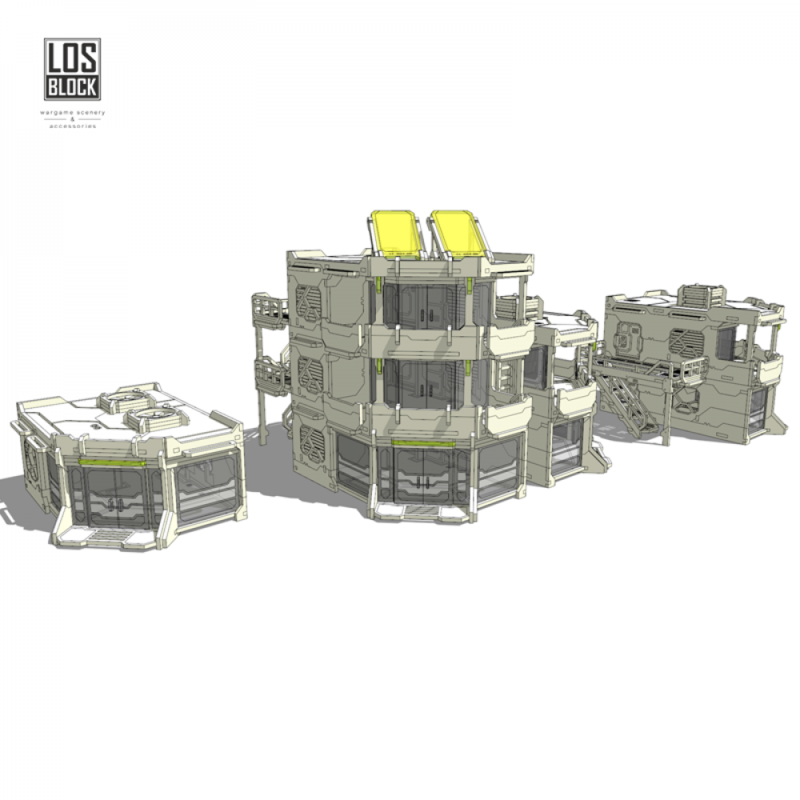 By adding Living Cell additional floor, CITY 3000 Building Connectors and other modules from CITY 3000 you can create big complexes. Compatible with all items from CITY 3000 series. With this set you can build several buildings with different hight or one big living complex. All doors and windows are easy to open, transparent panels are removable. The roof can be removed easily to get access to the interior. Interior and exterior are engraved. Living Cell. Main floor (right) - 1 pce. Living Cell. Main floor (left) - 1 pce. Living Cell additional floor (right) - 1 pce. Living Cell additional floor (left) - 1 pce. Living Cell Closed. Main floor (right) - 1 pce. Living Cell Closed. Main floor (left) - 1 pce. Living Cell Closed additional floor (right) - 1 pce. Living Cell Closed additional floor (left) - 1 pce. CITY 3000 Building Connectors - 1 pce. Rooftop Ventings - 1 pce. Power Panels - 1 pce. Material: HDF, transparent, fluorescent methacrylate. This set is supplied unpainted and requires assembly. Additional level for Living Cells. Compatible with all items from CITY 3000 series.&n.. Living Cell - is futuristic building modules that will look great on any game table.&..
Are you still fighting in villages? Stop it! 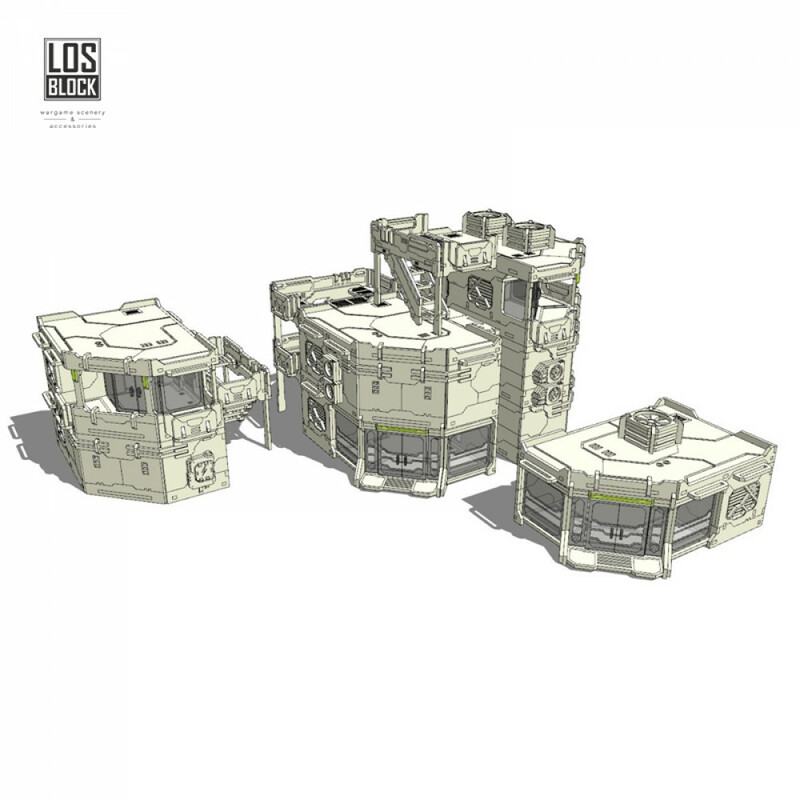 This ultimate set will bring you to the future megapoli..
Central Hub is 8х8 inch building with 4 openable doors and removable modular roof. Pe..
Additional floor for Central Hub. Easy to install/remove from the building. You ca..
Skywalk series consists of crossing, stairs and passages which can be combined with each other and a..
Skywalk series consists of towers, stairs and passages which can be combined with each other and all.. Provides an easy access to all levels. Compatible with all products from CITY 3000 series. St.. These connectors are designed to link CITY 3000 buildings into big complexes. After connection ..
Office is a modular building from CITY 3000 series. Perfect for any game table. Designed f..
Additional borders for buildings. Compatible with all items from CITY 3000 series. This set .. In the far future construction demands fast, easy and cheap solutions. Universal Module is a multif..
Electric panels for building decorations Material: HDF. In set 6 panels. This set is suppli..
First Office Additional floor layout. Office is a modular building from CITY ..
Conditioners for building decorations Material: HDF. In set 6 conditioners. This set is sup..
Second Office Additional floor layout. Office is a modular building from CITY 3000 seri.. Lift cabin is easily sliding by guiding rails installed in universal CITY 3000 joints. It can be sto..
A set of damaged windows. Compatible with offices and hallways from CITY 3000 series. Materi..
Wall ventings for building decorations Material: HDF. In set 3 pcs. This set is supplied un..
A set of doorblocks used for blocking unused doors. Compatible with all items from CITY 30..
Antennas for building decorations. Can be set up on any 3 mm thick border. In set 4 antennas. ..
Additional ladders for buildings. Compatible with all items from CITY 3000 series. This set ..
Satellites for building decorations. Can be set up on any 3 mm thick border. In set 4 satell..
Large balconies CITY 3000 buildings. Size: 13 cm x 4 cm Material: HDF This set is suppl..
Small balconies CITY 3000 buildings. Size: 8 cm x 4 cm Material: HDF. This set is suppl..
Additional handrails for buildings. Compatible with all items from CITY 3000 series. This se.. Objective Zone is 8х8 inch scenery element specially designed for ITS missions like T..
8 additional passages inserts for Universal Module Material: HDF This set is supplied unpaint..
8 additional wall inserts for Universal Module Material: HDF This set is supplied unpainted a..
8 additional window inserts for Universal Module Material: HDF This set is supplied unpainted..